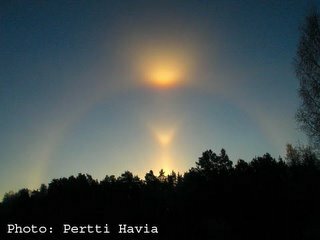 This display was photographed by Pertti Havia on 21. December 2005 in Huhko, Southern Finland. The V-shaped Moilanen arc above the tree line is well developed. Nesting in the glow of the 22° upper tangent arcs, there is also upper sunvex Parry arc. (Shows better in unsharp masked photo which is not shown here). Is this a "snow machine" or a natural crystal display? Snow machines seem rather fond of making M-arcs!